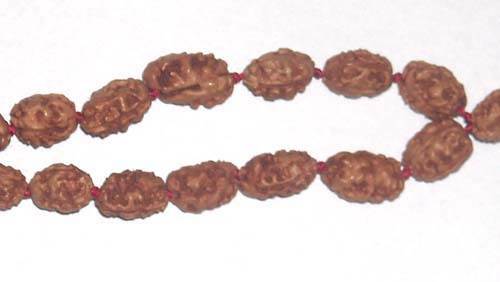 Rare collecter five mukhi rudraksh beads at one place and is very auspicious to wear or place at your puja ghar. This Mala or Kantha is used to sublimate the malefic effects of Jupiter such as lack of peace, poverty , lack of harmony etc. It helps attain success in all walks of life and gain knowledge, wealth, power, fame nd achieve goals. It also represents Lord Shiva and is very effective in the elimination your enemies. 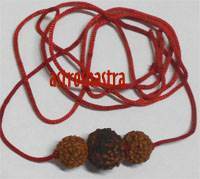 All five Brahmas are pleased with the devotee who wears this Rudrakshs. Lord Rudra also give success in all the efforts made by such a devotee. Diseases do not come near the wearer of it. 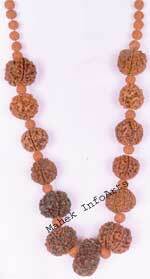 One who wears these five faced Rudraksh (Rudraksha) obtains all kind of riches and prosperity. Persons suffering from high blood pressure get relief by wearing these but one should select them very carefully, or better they take the help of experts. It helps in diseases pertaining to lungs, heart and blood.